Stanley Kubrick's film incorporated unique camerawork (using prototype Zeiss lenses) with numerous scenes filmed only with natural candlelight. Yul Brynner's final film and the sequel to Westworld (1973) featured the first use of 3D CGI in a live-action film. The CG graphic was created by the early computer visual effects company Triple I. The efforts of the special effects engineers were recognized with a Scientific & Engineering Academy Award in 1994. The segment was a very brief, computer-digitized 3D representation (rendering) of the animation of a hand and face (Peter Fonda's). The film also used 2-D digital compositing to materialize characters over a background. This Steven Spielberg film lost the Best Achievement in Visual Effects Academy Award to Star Wars (1977). The film's special effects were limited and kept mysteriously shrouded for much of the film - an effective story-telling technique to build suspense and tension. It was notable, after a long anticipatory buildup, for the sequence of the landing of the impressive alien mother ship - a 400 lb. fiber-glass model that was four feet high and five feet wide. The UFO model was wired and lighted by fiber optics, incandescent bulbs, and neon tubes. One of the most fantastic scenes took place in Sinbad's (Patrick Wayne) tent, where evil witch/stepmother Queen Zenobia (Margaret Whiting) summoned three hideous chirping demons, stop-motion animated ghouls, to rise slowly from the campfire to battle against Sinbad. One ghoul with a burning torch was matched with the live-action filming of the torch, to create an exciting effect. There was a new name for the Academy Award for FX this year - Best Achievement in Visual Effects, won by this film. The iconic space opera Star Wars was competing against only one other nominee: Close Encounters of the Third Kind (1977). The Empire's moon-sized weapon/battle station, the Death Star, was to be assaulted by Luke Skywalker (Mark Hamill) and other Starfighters. Before the massive assault was a brief sequence called the Trench-Run Briefing, a training session for Rebel Alliance pilots. "The approach will not be easy. You're required to maneuver straight down this trench, and skim the surface to this point. The target area is only 2 meters wide. It's a small thermal exhaust port, right below the main port. The shaft leads directly to the reactor system. A precise hit will start a chain reaction which should destroy the station. Only a precise hit will set up a chain reaction. The shaft is ray-shielded, so you'll have to use proton torpedoes." One of the pilots objected: "That's impossible! Even for a computer." The computer image they viewed was the first extensive use of animated 3-D computer animation (or CGI). 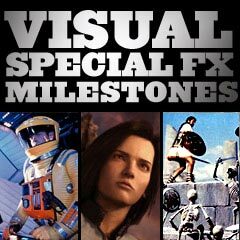 This was the first major work of George Lucas' visual effects company - Industrial Light & Magic (ILM), which would become the biggest, most prestigious FX company in film history. From inside a linear trench, the space dogfighters, including Luke Skywalker, would have to fly their X-wing fighters during attack runs down into the trench, and launch proton torpedos on a thermal exhaust port. Their goal was to obliterate the Death Star with chain-reaction explosions, just as the station was prepared to target the main Rebel base on Yavin IV. This special effect of the trench was created using a 40-foot scale model covered with plastic walls and towers. A computer model of the trench was also created, using lines of light to represent the various shapes. The climactic spaceship battle scene at the conclusion of the first episode of the epic trilogy was filmed with an innovative motion-controlled camera - its first use in film history. This meant that a computer was used to control a long, complex series of camera movements. Hooked up to a computer, the Dykstraflex motion-control system (named after special-effects supervisor John Dykstra) issued a complicated series of movements to the camera, to create remarkable shots. George Lucas would later add further visual effects to the film in a 1997 "Special Edition" release that featured far more advanced CGI characters and effects, including an enhanced Death Star explosion (pictured also), an added scene of a CGI Jabba the Hutt confronting Han Solo, and the infamous "Greedo fires first" edit. This film was revolutionary in many ways, and helped the film win the Academy Award for Special Achievement in Visual Effects. It was noted for its innovative 3-D-like effects in its film title sequence. It was the first film with a computer-generated title sequence. As the title sequence began, it zoomed and animated the words: "ALEXANDER SALKIND PRESENTS" and then continued with further zooms on the letters of the starring performers. The graphics also zoomed inward to present the famed S insignia for Superman. These effects were generated by what effects wizard Douglas Trumbull called "streak" photography (a close relative of his slit-scan technique used in 2001: A Space Odyssey (1968)), wherein flat artwork was extruded through a third dimension by moving the camera during the exposure of each frame of film. The motion of the camera was itself controlled by computer (in the same way a tool was controlled on a multi-axis CNC machine), but there was no CGI involved. The film also marked the first use of the Zoptic camera for the non-static flying sequences. This Ridley Scott film received the Oscar for Best Achievement in Visual Effects, defeating The Black Hole (1979), Moonraker (1979), 1941 (1979), and Star Trek: The Motion Picture (1979). The film used a raster wireframe 3-D model rendering for the spaceship Nostromo's navigational charts on its computer monitors in the rough landing sequence on the foreign planet. The computer monitor sequence showed a terrain fly-over, rendering computer-generated mountains as wireframed images as the spacecraft slowly landed and the perspective of the terrain changed. The film was best-known for the monstrous-looking alien (created as a model in some shots out of plasticene, vertebrae from snakes, and cooling tubes from a Rolls-Royce). It was first seen as a small, face-hugging creature (composed of sheep intestines). It was a genuinely shocking and memorable chest-bursting special effects scene in which crew member Kane (John Hurt) had his own blood and the monstrous Alien chest-burster (a puppet thrust through a fake torso, spewing real cow's blood and guts) graphically explode out of the front of his white T-shirt - the hissing, razor sharp-toothed monster-lizard looked around and then scurried off to hide. The trick shot involved a fiberglass chest piece (placed over the actor), tubes to squirt fake blood, a single hand puppet, and wires to help the alien race across the table. This PG film (Disney's first) was nominated for Best Visual Effects, losing to Alien (1979) (the winner), along with other nominees: Star Trek: The Motion Picture (1979), 1941 (1979), and Moonraker (1979). Similar to Superman (1978), CGI-like film titles were also used for the opening titles in this Disney film, and for some trailers. Jim Henson's muppets featured some of the trickiest and most advanced puppetry to date, such as Kermit riding a bicycle without any visible means of control, and Kermit playing a banjo in a swamp while singing The Rainbow Connection, etc. (In the latter scene, Jim Henson spent an entire day in a 50-gallon steel drum submerged in a pond). This special effects of this landmark science-fiction film were the work of visual effects supervisor Douglas Trumbull's company EEG, assisted by John Dykstra's Apogee. the USS Enterprise traveling at increased "warp speed"
In the astonishing "merge" scene in the film's finale, Commander Willard Decker (Stephen Collins) and the android machine Ilia (Persis Khambatta) came together in a glowing spectacle. Realizing that the only way V'Ger would be able to find value and meaning, complete its final sequence in its transmission, and "join" with and "touch" its creator, Decker - already deeply affected by the loss of former lover Lieut. Ilia (Persis Khambatta) - sacrificed himself to become one with the machine life-form. The merging of man ("human quality") and machine (Ilia had been abducted and replaced by V'Ger's identical-looking android probe) culminated in a dazzling explosion of white light, and the beginning of a new non-corporeal life-form ("We witnessed a birth. Possibly a next step in our evolution") from which the USS Enterprise majestically emerged, saved.